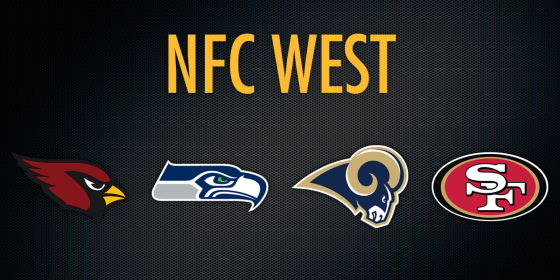 Tag Archive | "2017 NFC West Preview"
Seattle is the best team in a pedestrian at best NFC West Division. I don’t think the Seahawks are as talented as a 12-win team, but playing a soft division schedule as well as the AFC South will enable this team to pile on the wins. Russell Wilson still runs the show on offense, and he makes the receivers Jermaine Kearse and Doug Baldwin look better than they are. I have some question marks with the offensive line of this team that they really haven’t addressed. Eddie Lacy doesn’t convince me in the running game, but C.J. Prosise does. Look for Prosise to be the feature back and Eddie Lacy to struggle with his conditioning as usual. Defensively, this team is again going to be led by their secondary with Richard Sherman at corner and the safeties Kam Chancellor and Earl Thomas. Bringing in defensive tackle Sheldon Richardson from the Jets will really help Michael Bennett elevate his game to an even higher level for the defense. I wouldn’t be surprised if Seattle is a first round bye team that loses its first playoff game. Arizona could be a dangerous team this year, but based on last season’s performance, I will keep them at 7-9 for now. Carson Palmer and Larry Fitzgerald don’t have many years left, and they may put last year’s disappointment behind them and come out to play. Look for David Johnson to have another big season running the ball and look for him to make the elevation into an elite back (if you don’t consider him one already). A.Q. Shipley is a solid center and the team’s best offensive lineman. The secondary on this team is solid with cornerback Patrick Peterson at the forefront. Tramon Williams is up there in age but a solid professional player who has at least one more season left in him. Robert Nkemdiche has to elevate his game now in his second season. He did only play five games in his rookie year but, for such a highly touted player coming out of high school, he has been on a downward trend since then. Sometimes, bad seasons like last year happen, and Arizona may respond. If they don’t, however, look for many changes to be made. Los Angeles has to be questioning the way they handled Jared Goff his rookie season and that will almost certainly keep this team out of the playoffs this year. Goff did not show much to warrant playing time as a rookie, but starter Case Keenum was so awful that he didn’t warrant starts either. The Rams had plenty of time to develop Goff at least some last year and missed out. I think Goff can be a serviceable quarterback in the league, but this season will be similar to a rookie season. Sammy Watkins will help give Goff a needed playmaker but Watkins is injury prone. Andrew Whitworth is a nice addition to this line at left tackle and, having the blind side taken care of, will help Goff’s development. The defensive line which is usually strong did lose Chris Long in the offseason and has spectacular defensive tackle Aaron Donald holding out. With Wade Phillips moving this team to a 3-4 scheme as well, I wouldn’t be surprised to see some slippage in what has been a strong defense in years past. Kyle Shanahan is coaching a team this year on which a large majority of the roster is not in future plans for this team. Young players may make an impact and play their way into those plans but, for the most part, this is a burn season for the 49ers. Brian Hoyer will be serviceable at quarterback but not much else. Carlos Hyde (one of the few who I would assume is in the future plans) will have a high workload to keep this team from being a total embarrassment. Joe Staley at left tackle deserves better than this season. Eric Reid is a very good safety and also one of the players that should be in the future plans for this team. All in all, San Francisco is simply looking to be a professional team this year and find potential diamonds in their roster, and not much else.